This groovy repro shirt is perfect for a 1960's or a 1970's party. Being a reproduction shirt, it is nice and durable as well as machine washable. It possesses a variety of colors so it will match all kinds of pants. The predominant color is maroon or a dark cranberry, not red as the picture may suggest. The eye teasing pattern also contains gray, black and off black. 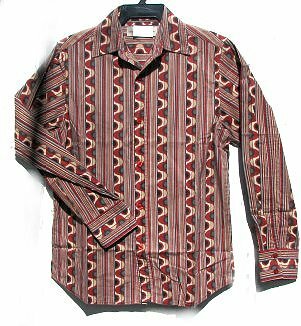 This shirt will match a plethora of colored polyester pants from various shades of gray, black, maroon and beige, as well as denim pants. The shirt is 100% cotton and preshrunk so it should not be hot. All kinds of men's matching original 70's polyester pants in mostly solid colors are available in various sizes for $25 - $39.00. I'll try to add links. Look on men's bellbottom page as well. Disco chains and matching 70s aviator eyeglasses available below. We ship very late at night at a 24 hour post office and can fed ex until fairly late as well.